The Mosaic Hotel - Beverly Hills places you within a 10-minute stroll of popular attractions such as Rodeo Drive and Century City. This 49-room, 4-star hotel welcomes guests with a restaurant, an outdoor pool, and a fitness center. Enjoy a bite to eat at the hotel's restaurant, or relax with a drink at the bar/lounge. Satisfy your hunger from the comfort of your room with room service. For your convenience, a cooked-to-order breakfast is served for a fee each morning from 7 AM to 11 AM. Guests can expect WiFi and 42-inch a TV with pay movies. Beds sport premium bedding and the bathroom offers a rainfall showerhead, a hair dryer, and designer toiletries. Other standard amenities include a minibar, an espresso maker, and free newspapers. 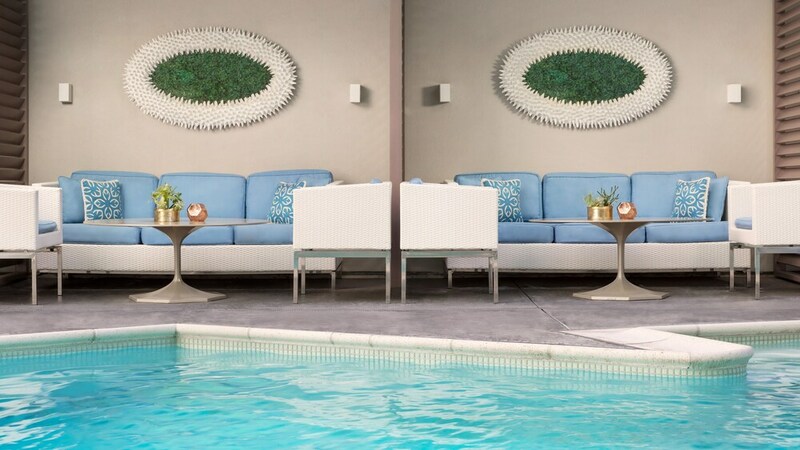 Guests staying at The Mosaic Hotel - Beverly Hills enjoy an outdoor pool, a fitness center, and free WiFi in public areas. Valet parking is available for USD 42.00 per night. The front desk has multilingual staff on hand 24/7 to help with concierge services, luggage storage, and dry cleaning/laundry. Other amenities at this boutique hotel include express check-out and free newspapers. The Mosaic Hotel - Beverly Hills features an outdoor pool and a fitness center. The hotel offers a restaurant. Guests can unwind with a drink at one of the hotel's bars, which include a poolside bar and a bar/lounge. Public areas are equipped with complimentary wireless Internet access. This business-friendly hotel also offers tour/ticket assistance, multilingual staff, and concierge services. Parking is available onsite for a surcharge. A total renovation of this property was completed in September 2015. The Mosaic Hotel - Beverly Hills is a smoke-free property. The Mosaic Hotel - Beverly Hills offers 49 air-conditioned accommodations with minibars and laptop-compatible safes. Beds feature premium bedding. Televisions come with pay movies. Bathrooms include rainfall showerheads, bathrobes, slippers, and designer toiletries. In-room wireless Internet access is available for a surcharge. Business-friendly amenities include desks, complimentary newspapers, and phones. Additionally, rooms include espresso makers and complimentary bottled water. Housekeeping is offered daily and hypo-allergenic bedding can be requested. Mosaic Dining Room - This restaurant specializes in Californian cuisine and serves breakfast, lunch, and dinner. Guests can enjoy drinks at the bar. Open daily. Start your morning with a cooked-to-order breakfast, available each day from 7 AM to 11 AM for a surcharge. Room service is available during limited hours.